I lost my cell phone. Help! We have all been there before – our precious cell phone has suddenly gone missing and we have no idea where it is. We do a quick check of all the places that we normally put it; it isn’t there. We rehash every event from the time we last remember having our mobile phone to the time when we first noticed that it was missing. Where did we go? Who were we with? What was I wearing? We try calling our cell phone in the hope that the ringer is on and that it is somewhere nearby. We pace frantically through our home and run out to the car in the hopes of hearing our awesome ringtone. But when all of this fails us, we are simply left with worry. All we can do is hope that some switch will flip in our brain and we will all of a sudden “remember” exactly where it is. 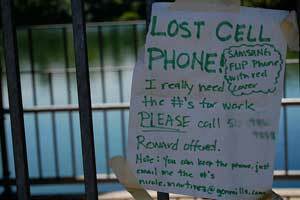 How can we increase the likelihood of actually finding a lost cell phone? GPS tracking! Have a GPS tracking app on your phone. This will either need to be already installed or you will need to install it remotely (see here for tips on remote installation). Access your phone’s location using the web. Most tracking apps have some sort of web interface through which you can access your tracking information remotely. Do this; it should tell you where your phone is. Your cell phone must be on. Your cell phone must have a connection to your network or be connected to WiFi. Your cell phone must be able to get messages from GPS satellites. If you fail in any one of these items you will not be able to us GPS tracking to find your mobile. Sorry. If you have not already heard, GPS stands for the Global Positioning System and is a series of satellites that emit a radio signal that can be read by specialized GPS receivers. These receivers use the information encoded in the radio signals to do a little math called trilateration. Once that equation is done, the GPS device will know its exact location on the globe. Pretty niffty, right? GPS systems have become increasingly smaller over the years and have made their way into pretty much every single smarphone on the market. Chances are, if you own a newer cell phone that runs Android or iOS then you have GPS in your phone. GPS tracking occurs when the position information is gathered by the device. This information is either stored locally or sent out from the device of the network. The former process is called data logging, and is only GPS tracking of a sort. The latter process is what most people think of when they talk about GPS tracking and is often referred to as real-time GPS tracking. If you are trying to find a lost cell phone they you are trying to use the second variety. Once the cell phone has found its exact location using GPS (or by a very similar mathematical process using cell phone tower signals) it can send that information out over the wireless network to which it is connected. The cell phone only needs to be on. Most tracking programs will work behind the scenes with little to no action taken by a user. Therefore, the cell phone must be on so that it can process the signals it is receiving from the GPS satellites and talk over the cell phone network. It must have a network connection of some kind to send the information that it gathers from the satellites. This information then travels across the network to the company that is helping you track your phone. Finally, it must be able to get messages from the GPS satellites in order to find its position in the world. If it has no position information it will have nothing to communicate. Our post on How To Install GPS Tracking Apps Remotely To Find A Lost Or Stolen Android Cell Phone also contains a list of all apps that can be downloaded and installed to your phone remotely that we have personally tested on our Android phones. Also, if you feel like paying for something that you could do for yourself for free then you could always go with a one of your provider’s tracking plans. I have seen a family plan for a little as $5 a month depending on your current service agreement. While this is a nominal payment, it is ∞ more expensive than free! If you can get the same service for free, why not do it? No matter what your final choice for an app is, you are definitely going to need to have a data plan that will allow for the transmission of data across the network. Most people already have one anyway (you own a smartphone, after all). Those that do not have a data plan are often not worried about losing a phone that only costs $40 to replace! Data plans are important because your cell phone will have to send the information about its position across the network if you want to track the phone in real time. You can’t find your lost cell phone without your cell phone telling you where it is. It can’t do that if it doesn’t have any way to send its coordinates out over a wireless network. This is just one additional application. There are many more, from social apps to navigation apps, that can leverage the power of GPS to make life easier, more interesting or just plain fun.